Lam has no degree in agriculture. Born and raised in Hong Kong, he is known as a commercial TV director. 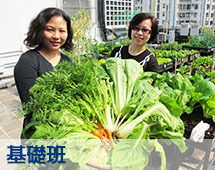 Lam and his wife have long been holiday farmers, with a small 100 sq ft field in the New Territories to grow carrots, spinach, cucumbers and other seasonal vegetables. But in 2005 he started a company called Eco Mama, selling second-hand baby gear like strollers and cribs. Because his business was not doing well, he was forced to rent a rooftop office. After a few years, Eco Mama’s high overhead costs for rental and manpower forced them to close the business. 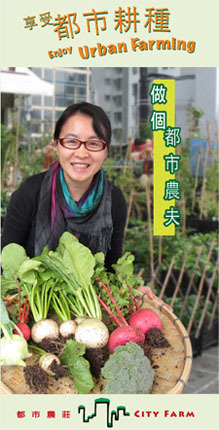 But Lam saw the potential for urban farming at rooftops, and a business opportunity: there was plenty of outdoor space, and sunlight to grow vegetables. After two and a half years of testing, he has found the perfect blend of soil from Germany and the Netherlands, ideal for growing vegetables in the rooftop planters. “Hong Kong has humid conditions with a lot of rain, so it is important to consider water drainage in the soil,” he explains. 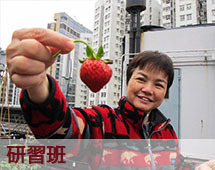 Lam also realised that not all rooftops in Hong Kong are suitable for farming. It was with careful consideration that he selected his two current locations. Both are industrial buildings with excellent sunlight and no pollution. “As most factories have moved to China, these buildings are now office spaces with no industrial pollution,” the urban farmer explains. 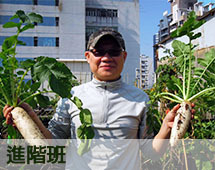 “It has to be high enough, with no skyscrapers next to it so that there is good air flow, good air quality, and must have easy access to our clients.” This summer, there is much activity in his two rooftop farms: his eager fellow gardeners are growing cucumbers, pumpkins and Chinese vegetables. “Being a farmer means an endless education,” says Lam. “Farming can be as simple as putting the seed into the ground, then leaving it unattended, or it can be a PhD degree. Once you click into that interest, you absorb [knowledge] like a sponge — from friends and relatives, from the internet and books.” Lam quickly learnt that farming involves a lot of trial and error, so sharing information is essential. He set up a City Farm Facebook page with numerous photos of his students smiling and posing with their harvest. At weekends families come to visit and work together on their planters. Lam is quick to admit that the vegetables grown by his clients are not even enough for their own household consumption: “You would need at least 400 sq ft to provide for one person’s consumption,” he says. Yet, something magical is happening to these urban dwellers. 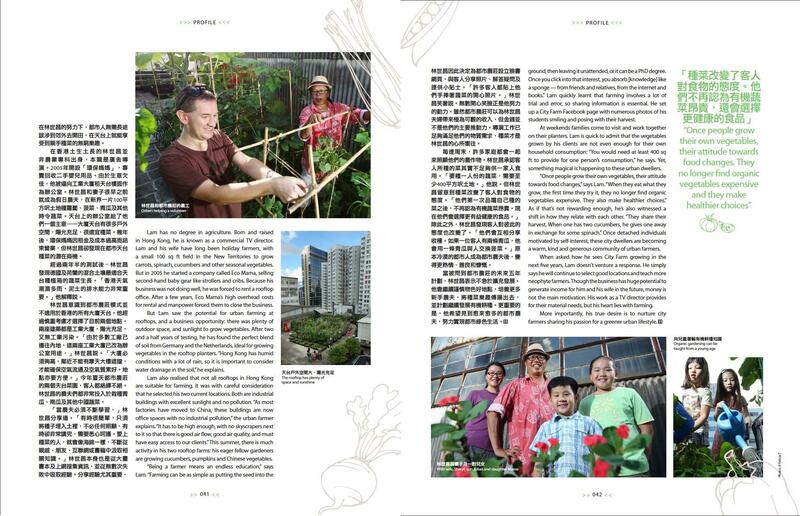 “Once people grow their own vegetables, their attitude towards food changes,” says Lam. “When they eat what they grow, the first time they try it, they no longer find organic vegetables expensive. They also make healthier choices.” As if that’s not rewarding enough, he’s also witnessed a shift in how they relate with each other. “They share their harvest. When one has two cucumbers, he gives one away in exchange for some spinach.” Once detached individuals motivated by self-interest, these city dwellers are becoming a warm, kind and generous community of urban farmers. When asked how he sees City Farm growing in the next five years, Lam doesn’t venture a response. He simply says he will continue to select good locations and teach more neophyte farmers. Though the business has huge potential to generate income for him and his wife in the future, money is not the main motivation. His work as a TV director provides for their material needs, but his heart lies with farming. 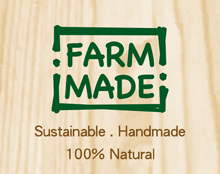 More importantly, his true desire is to nurture city farmers sharing his passion for a greener urban lifestyle. Powered by AB Studio Limited Copyright 2012-2015. 'City Farm' All Rights Reserved.